The Pretty Bean at Etsy rescues used plastic bags from landfill purgatory by transmuting them into something drool-worthy—literally! Fused into flat sheets using an iron, then cut and edged with bias tape to form sturdy, reversible bibs, the plastic scourges have cleaned up their act to protect against mealtime messes with the zeal of the reformed. Adorned with colorful graphics that impart a pop-culturish vibe, the bibs are also waterproof, so they only need to be wiped with a damp cloth before they’re ready to spring back into action. I got one of your bibs may 2010 as a baby shower gift for a lady who i went to school with and turns out was pregnant too. well i have a friend who is having a baby shower in 2 days and i want to get her one but i didn't get the invite till it was too late to order one in time. sp i am making it took me like 30 min for it to fuse together. is there a simple way or chould it be the bags i used or just plain and simple my iron. 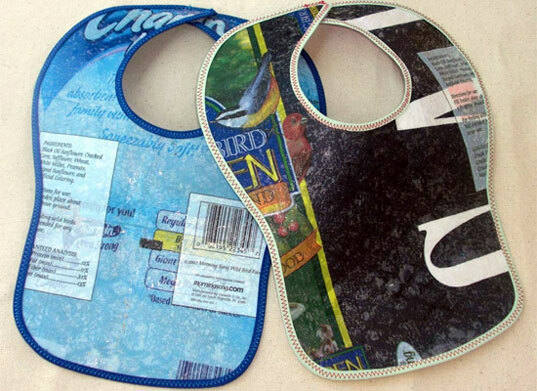 That eco friendly bib idea is great. I am a big supporter of anything that concerns the betterment of our environment. The Pretty Bean at Etsy rescues used plastic bags from landfill purgatory by transmuting them into something drool-worthy�literally! Fused into flat sheets using an iron, then cut and edged with bias tape to form sturdy, reversible bibs, the plastic scourges have cleaned up their act to protect against mealtime messes with the zeal of the reformed. Adorned with colorful graphics that impart a pop-culturish vibe, the bibs are also waterproof, so they only need to be wiped with a damp cloth before they're ready to spring back into action.